A Cat Illness Or Just A Hairball? Cat vomiting does not always mean your pet is sick. Cats will vomit from time to time and it can be a perfectly natural thing to happen. They may have eaten something which has upset their tummy or they may have picked up a little virus, just like we all do occasionally. In these cases the problem will usually clear up in day or so and is nothing for owners to worry about. There are some other common causes of vomiting which are not related to an actual cat illness and which the pet owner need not worry about too much. If there are worms or other objects in the vomit. If the sick cat has been near potentially poisonous substances. If the animal appears depressed, lethargic or otherwise unwell. If there are other cat health symptoms such as weight loss, diarrhea, constipation, or other signs of cat illnesses. Your vet will help get to the bottom of the problem, identify a proper diagnosis and give appropriate treatment and advice. There are a few home treatments available which may help with chronic or less urgent problems and which may also help while the sick cat is recovering from an illness. Often cats will throw up their food if they eat too quickly or if they swallow their food without chewing enough. Some cats do this because they may have previously been a stray and got used to having to eat very quickly, or it may have been a habit they have developed. Eating too quickly will cause bloating and stomach irritation which will result in sickness. Our previous cat Little Mo also had this habit, which seems common to a lot of animals. She would bolt her food down without even chewing it. We solved the problem by feeding her regular, light, smaller meals and this soon stopped the daily vomiting. Sometimes an animal will eat something which is indigestible such as a non-food item. The cat will want to purge it from their system as quickly as possible. It may not be nice, but checking that there is nothing in the vomit is a good idea if you suspect that they have eaten something like this. Our cat, Little Mo was a champion vomiter for a while until we changed her food which was obviously too rich for her. 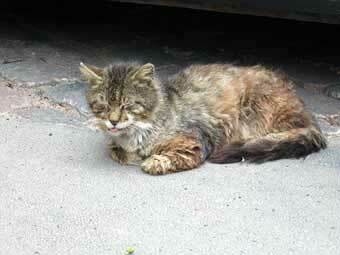 Some cats have delicate stomachs and some of the processed foods available are just too rich for them to digest. Always choose the best quality food possible for your pet. Another common reason for vomiting in cats is car travel. If your cat reacts badly when you have to take them out, it may be a good idea to try and acclimatized them first by taking them for short journeys on a regular basis, so they get used to the motion of the vehicle. It is also best to avoid feeding them shortly before a journey, and try covering their basket with a towel to help keep them calm. If a journey is essential and all you've tried has failed, then your vet can prescribe some anti-sickness tablets or maybe a mild sedative. I actually made our poor little cat vomit from motion sickness one time just because I didn't realize I was swinging her in the carry basket as I carried her along one day! As soon as I got to where we were going, which wasn't even a very long walk, I opened the basket and... puke... out it came! Hairball's are another common reason for vomiting in cats and similarly this is usually nothing to worry about. The cat normally manages to get rid of the hairball themselves and if not there are products which can help the process along. See our page all about hairballs to find out more. 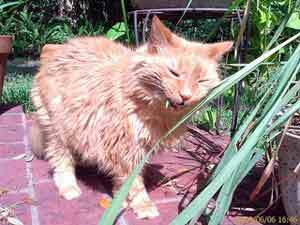 Eating Grass will often cause cats to vomit and again this is generally nothing to worry about. It is believed that cats will eat grass to help them get rid of hairball's themselves. As a general rule, as long as your cat appears to be healthy and happy and all is well otherwise, an occasional episode of cat vomiting should leave you unconcerned. However, if the cat vomiting keeps happening, or there are other symptoms as well, then we need to take things more seriously as it may be a sign of a more serious cat illness. If your pet is vomiting a lot and cannot keep any fluids down then they can be at great risk of dehydration. This is especially the case when the vomiting is accompanied by diarrhea. Lethargy (unusual tiredness and unwillingness to do usual activities). Skin loses its elasticity due to dryness (when the skin behind its neck is pinched, the fold remains longer than usual). These are all cases for concern and we would always recommend you get your sick cat to the vet as soon as possible. Trying to persuade your feline companion to drink water is not easy and dehydration can set in quickly. Sometimes encouraging them to drink from a dripping tap can help, but if dehydration has really set in, then a vet will be the only one able to re-hydrate them using subcutaneous or intravenous fluids to return them to good cat health.